Pot Marjoram is a perennial herb that is commonly used for culinary purposes. The sweet pine and citrus flavors are often used to flavour meats, salads, vinegars, and casserole dishes. The plant also has extensive medicinal properties and was known to the Greeks and Romans as a symbol of happiness. It will grow well in a sunny position but tolerates some shade. The plant will attract bees and butterflies when in flower during the summer. It is reported to be a good companion in the vegetable garden improving the flavour of nearby crops. To order this plant please contact us balkanecologyproject@gmail.com. Possible allergic reactions as to basil, hyssop, lavender, mint, oregano and sage: Marjoram can cause allergic reactions in people allergic to these plants and other members of the Lamiaceae family of plants. It is in flower from June to September, and the seeds ripen from Aug to September. The flowers are hermaphrodite (have both male and female organs) and are pollinated by Bees. r meats, salads, vinegars, and casserole dishes. It has a stronger affect on the nervous system than the related oregano (O. vulgare). The herb is antiseptic, antispasmodic, carminative, cholagogue, diaphoretic, diuretic, emmenagogue, expectorant, stimulant, stomachic and mildly tonic. 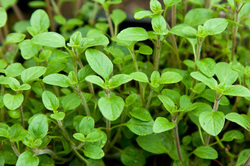 Oil: Marjoram oil is used to scent soap and perfume pomades. Flavour is strongest right before flower buds open in summer. Harvesting at this time will also reduce seed set and encourage herbaceous development. Good heat and drought tolerance.